Hang on. Before you decide that I must be too lazy to watch my kid or something, allow me to remind you of a little story. Last month, Norton tried to take off in the library. I was holding his hand. He got hurt. And we ended up spending hours in the hospital getting x-rays since he couldn’t use his arm at all. That was when I found out about nursemaid’s elbow. Nursemaid’s elbow is apparently an extremely common injury that results from some sort of tugging (whether it’s because a parent swings the kid around by the arms, a toddler who is holding hands trips, or any number of other things). Norton didn’t have nursemaid’s elbow, although that was what they’d thought it was at first. He just had a sprain that essentially immobilized his arm for a day. If I had kept Norton on his toddler leash instead of trying to hold his hand, he wouldn’t have gotten hurt. You see, I can’t actually carry Norton all that long because I have symphysis pubis dysfunction, so things hurt. Plus, he’s heavy. Not only that, but my husband is six inches taller than me. I have to lean a little bit to hold Norton’s hand. He’d have to hunch over. It’s just not practical for him to try to hold hands with Norton at this point in time. Not until Norton is a little taller. Sure, he can carry Norton, but Norton is a toddler who is bent on experiencing that toddler independence. Using a toddler leash allows Norton the independence that he craves and the safety that we demand. For moms of multiples (or multiple young children), using a toddler leash can help prevent children from scattering. It can help the disabled parent who can’t keep up. In theme parks, it allows those children to look around and not kill their parents’ backs. And you know what? As for the argument about how leashes are for dogs, I’ll tell you that I keep my dog on a leash when we go for walks to keep him safe. I certainly don’t want him to get curious and fall in the river or wander in front of a car. If I care that much to keep my dog safe, shouldn’t I care that much about keeping my child safe? Grab a Hot Topic Tuesday Button to post on your Hot Topic Tuesday post, and don’t forget to leave your link at the bottom! 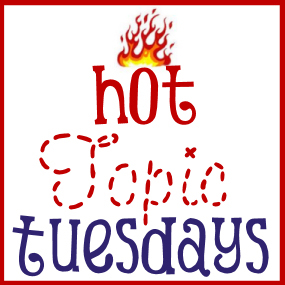 Next week’s Hot Topic Tuesday subject: Bedsharing, room sharing, or put baby in his own room? I have two hands and three kids. You do the math! I am all for toddler leashes in certain situations. Disney is a perfect example. When hubby was a child his mother put him on a leash and tied him to the clothesline. No joke. I certainly would never do that, but I don’t think there’s anything wrong with using a toddler leash for safety. Like anything, it can be misused, of course. But yeah, unless you grow a third arm, it’s a little more difficult when you’re outnumbered! I don’t use a toddler leash. Rant about how horrible they are? Nah. I thought we would have to use one for a while. N would slip his hand out of any grip and move away very quickly, but he also didn’t want to be in the stroller or the Ergo. People talked about how THEY could get THEIR children to hold their hands and not run off, so anyone could. Um… really? Are anyone’s kids exactly the same in any other way? Why would that be the same? If I ever went to Disney World or New York City or some other hectic place like that, I might get a harness just for backup. I really don’t understand how it could possibly be more constraining than a stroller or a carrier. I use both sometimes, and they’re great, but a harness seems liberating when used in moderation. I’ve heard people argue “WHAT ABOUT THEIR DIGNITY? !”–um, my child smiles as he poops his pants (in a diaper). Clearly dignity isn’t a concern for him. It’s not like people WANT to make their kids feel like dogs, but the kids are perfectly happy and it helps the parents keep them safe. I don’t know how that’s horrible. Darn it, I need a “like” button for comments. To say I hate child leashes would be a minor understatement. I can’t stand them, don’t own one, and feel a bit of sanctomominess when I see one used. I have three kids 5 and under. My middle one has issues, and never once have “I” ever used… one. That’s me. I keep my kids safe without one. It’s all about safety. Who am I to say what is the best way for “YOU” to keep your child safe? If you feel the need to use one to keep your child safe, then other’s opinions don’t count. Heh. After ending up at the hospital for hours with Norton because I tried to hold his hand and he got hurt when he tried to wrench himself away, I’m honestly afraid to go without the leash. Sade had nursemaids elbow too. 🙁 They aren’t for me, unless they come in adult sizes for my FIL with a TBI who keeps wandering off. Great viewpoint, I don’t know if I will be buying a leash but you made me think about it and inspired a blog so I linked back to you! I haven’t used one. I used to think they were for lazy people. Then I saw how quickly my niece got away from her mom. She is too heavy for a stroller, so when we were planning our Disney trip this summer, I suggested a harness. My sister in law acted like I was crazy, and didn’t use it. Regardless of anything else, the choice to use or not use a harness is a choice for each parent to make. Like said above – it can be abused, but if it is used appropriately, it can be a sanity saver on top of a safety tool. Handholding seemed like a great idea, until I realized that it means the little person is keeping their hand up above their head for a long time. Ever tried doing that? Not terribly comfortable for anyone. Bolting hasn’t been an issue with my daughter, but since we’re going to be undergoing fertility treatments for me to get pregnant again, there’s an increased likelihood of twins the next time around. If I have two toddlers and a preschooler, you can bet you sweet badunkadunk I’ll be using a toddler leash on at least one of the brood!